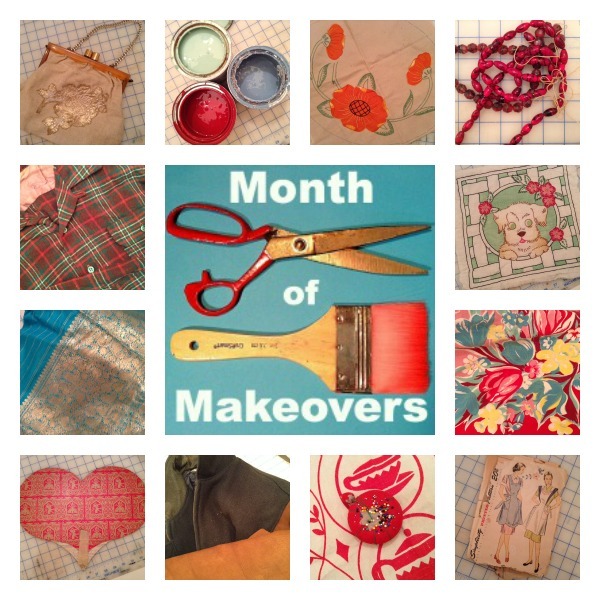 Welcome to our very first Month of Madness…er…Makeovers! For the entire 31 days of October 2013 we’re joining the fun with hundreds of other bloggers at the big link party hosted by The Nester. It’s junk transformation time! How could we pass up the ultimate opportunity to start–and finish!–all those projects we thought we might complete someday? Someday is NOW. We’ve got all sorts of interesting vintage things stashed away that need just a little magic to become extra special–or just plain useable. We might even have a decorating project or two up our sleeves. We hope you’ll stick around to see what we’ve got in store. Links to all the month’s posts will be listed below. Day 4: And there was light! Um, sorta. Day 7: Curvy, chrome-y, Cosco love! Day 8: Hey, hey, it’s a monkey! Day 10: It’s our Thursday Hack Flashback! Day 14: It’s happy hour! Day 20-1/2: I’ve got mail! We’ll be checking out your projects, too! This was so much fun, to see what you have both been up to all month. Elisabeth certainly gets her gift for making something out of nothing from the two of you. And from your Dad and Grandpap, of course! Thanks, Cynthia! It was fun and crazy, especially with moving Mom from house to house at the end. I’d love to see what Elisabeth is doing!